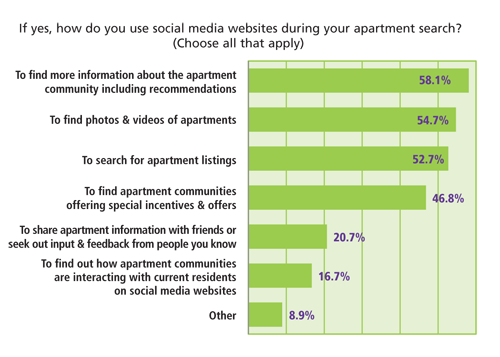 Survey Says: Renters Shy Away from Social Media During Their Apartment Search? But Only a Quarter Use It to Shop for a Place to Live"
In any case, the majority of renters indicated they are not checking out social media websites to find a place to live. (This makes sense.) That said, renter search behavior is always a moving target -- 70 percent of the survey respondents who said they do not use social media during their apartment search indicated they would either consider using it or are on the fence. Social Media: For Prospects or For Residents? Reasons for why this number seems high can be attributed to the lack of apartment communities participating in the social media space, or not getting the word out to residents, and the growing number of new renters hitting the market. While this might seem like an epidemic, I hardly think it's an issue that is exclusive to the multifamily industry. Ask that same 90 percent if they're connected to their local grocery store, or plumber, or family restaurant "on any social media website," and I'm guessing that the answers would be very similar. People largely participate in social networking to connect with friends, not to receive marketing messages from businesses. As social media continues to evolve online communications, we believe more apartment communities will follow suit and become more visible in this space. Residents will likely be receptive to interacting with their apartment communities in this way, especially if the content is meaningful. 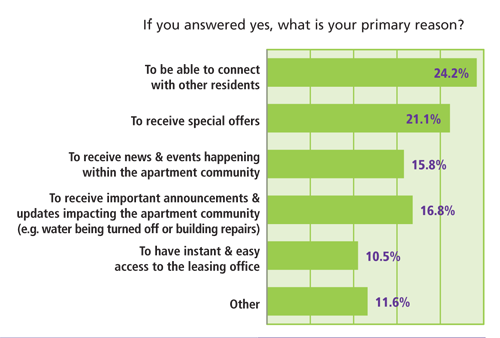 Our survey tells us that residents want to connect with their apartment community through social media to receive special offers, gain access to other residents and to keep current on community news and events. He's exactly right about meaningful content, and that can go well beyond offers and updates about community news. While nearly two thirds of all survey respondents said they are social media users, most are only active on Facebook. Nearly 35 percent indicated they check Facebook as often as every couple of hours and 32 percent visit at least once a day. This is a sharp contrast compared to their activity on any other social media websites. On average, more than 65 percent of survey respondents have never logged on to Yelp or Foursquare (Do you need to login to Yelp to benefit from others' reviews? ), and more than half have never visited Twitter or MySpace. Now you can start to see why it's important to define what we mean by "social media" for the purposes of these discussions. So what are the takeaways for apartment marketers? * Embrace reviews (and open dialogue in general). People want them. Apartment Ratings isn't going away. Deal with it and make it work for you. * Go multimedia. People don't want 2-D floor plans. They want video tours, interviews with property staff, photos of decorated model units, common amenities & resident events, and resident testimonials. * Syndicate your deals. This one's a little dicey, because the content still needs to be relevant to a large part of your audience that may not be searching for an apartment right now. That said, if prospects are looking for reviews on Yelp, wouldn't you also want them to see your current special there? * Make it easy to share your content. Do you have features like the ShareThis widget and the Facebook Like button on your property website? Prospects want the opinions of their friends; making it easy for them to share your content and get feedback about your community provides a service to your prospect and exposes your brand to more people in the process. You can see more details from the Apartments.com survey here, and Brent Williams already has an active debate on this data over at Multifamily Insiders. What do you think? Does this match your company's experience with social media? Will social media grow in importance as part of the apartment search process? Are we still asking the wrong questions, as some commenters have suggested over on MFI? I've presented the data (with some commentary along the way) ... the comments are yours. To receive a copy of results from future surveys like this, please contact Tammy Kotula at Apartments.com.